The Theremin can easily be consider the grandfather of the analog monophonic synthesizer. Looking very much as a vintage laboratory tool, its two antennas tend to make it look more as an experimental valve radio than a musical instrument, with some obvious Cyberpunk flavor! Invented by Lev Termen almost 100 years ago, its name Theremin is the Americanized version of the inventor’s name. The ghosty like and very natural sounding voice it has, could have become much more popular if it wasn’t for the Theremin’s ridiculously difficult interface, that make playing it in tune a really hard task without a proper preparation. The two antennas capture the movement of any object around. Arms and hands are used for the two possible variables that can be changed: Pitch and volume. What sounds pretty easy is in reality very tricky, the movements must be very precise, millimetrical. I suppose this is the main reason Theremin has been popular to violinists. Violins are notoriously difficult to play in pitch with precision, to do it you have to dedicate a hard work of learning. Obviously they’re the perfect choice if you’re looking for a reliable service, but possibly limited to professional performers only, due to their expensive price. One extremely cheap and valid alternative is the Theremino Theremin. To be honest a Theremin with a USB port only, can look extremely suspicious to the more traditionalists of us. having to do with a soft synth sound generator, can look not too interesting. What we will consider here, is the opportunity to have a valid and easy to setup interface, to be used to drive our trusted analog synths. The scope of this experiment will be to play through the Theremino Theremin interface a 1977 Minimoog. Using one oscillator only and its triangular waveform, we should arrive to a pretty good Theremin sound! As the cards can be bought already assembled, mounting a Theremino Theremin is an easy and fast operation. What we need for a complete Theremin is a Master and two CapSensor cards. All is connected through simple multi connectors ribbons and the USB is connected to the PC. What happens is that the two antenna capture the movement of the body and generate SLOT values, that are converted from the Theremino Theremin software in notes. Usually the left hand is used for volume and the right for pitch information. Originally the Theremino Theremin was able only to play its soft synth, but recent developments permit do a lot more. Installing the LoopMIDI shareware application, Theremino Theremin slot data can be converter in MIDI values through the Theremino SlotsToMidi, avoiding the use of the Theremin soft synth, but using the MIDI to play a real synth instead. To be closer in sound to the original, we will use a vintage Minimoog, converting MIDI to Voltage control, through a Kenton Interface. 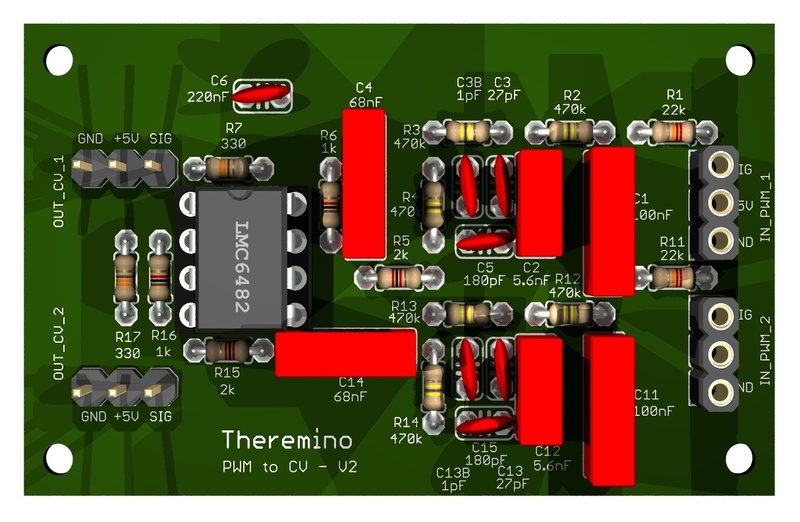 The Theremino engineers designed a special card to be used as PWM to MIDI converter, but only the DIY design project and schematics exist. I hope to write soon a follow up, experimenting with practical examples. The idea is to drive my minimoog through the Theremino Synth antennas.